Works really, really well; is nice and fast; delivers high-quality results. Impressed! From the ready room to the air in a paragraph break. How about this for writing, from James Salter’s The Hunters, his 1956 novel about fighter pilots in the Korean war. Cleve is an Air Force captain; he’s taking off on his first mission from his new posting. Cleve dressed himself slowly to reduce the time he would have to spend standing around and taking little part in the talk. He was not fully at ease. It was still like being a guest at a family reunion, with all the unfamiliar references. He felt relieved when finally they rode out to their ships. Then it was intoxicating. The smooth takeoff, and the free feeling of having the world drop away. Soon after leaving the ground, they were crossing patches of stratus that lay in the valleys as heavy and white as glaciers. North for the fifth time. It was still all adventure, as exciting as love, as frightening. Cleve rejoiced in it. Beautiful; not quite ‘spare’, but stripped down to only that which is necessary to tell the story, about how a man feels in the air. The rest of the book is continuing to be as good. Nice write-up of this show from Denise – I greatly enjoyed it, and agree with most of what she wrote. I particularly enjoyed examples of the SLS (3D printing technique) process, notably, the case showing what emerges from the printer – and how much material is brushed away by hand to reveal the object thereafter. Many of the exhibits they showed were magical, and yet they worked hard to remove the magic from the _processes_, and I really think they pulled that off. Great interview with Teki Latex, whose mixtapes are always a ton of _fun_. Nice notes on clubs, playing records, and the technique videos are top fun. He thinks really hard about helping people enjoy themselves. Good questions, too. Nice interview and profile; when I read it, I remembered how much I enjoyed _Grafts_. Some properly gnarly games maths, laid out. I understood some of it? But always nice to see what goes into things, even when you don't enjoy them, especially at that technical-art conjunction. This feels really familiar. I roughly agree with a lot of it (I miss straight up server-side MVC, the reactive pattern is a winner, React makes a lot of sense for PWAs, I feel old). But it's well written and covers some good ground. (I do like how Dan Abramov writes about code). "At the turn of the millennium, the internet seemed full of heartfelt pitches. Millions of users singing the praises of their favourite things – crowding around them, talking about them, calling for others to recognize their charms. Not the sturm und drang of social media: just clear-throated whoops, and echoes. Strangers like Pedro logging on to share their passions, not just once but every week, long after they had earned their Into the Grove membership rights, as if they couldn't help themselves." I made a small display for my living room. This project began when we installed a Hive thermostat at home. For various reasons, the thermostat ended up on the upstairs landing, and I thought it’d be nice to have a second display for it downstairs. I know I can look at the app on my phone, but I thought something more ambient might be nice. And, whilst I was at it, one feature I’d always wanted – the next trains at my nearest stations – and perhaps the outdoor temperature and weather as well. This all coincided with Bryan Boyer writing up his Very Slow Movie Player project, which is a delight. (It shows a movie at a frame a minute, on a large e-ink screen). I’ve been fascinated with e-ink for a long while. I’m well into the lifespan of my second Kindle, and it’s such a wonderfully un-technological piece of technology. It’s still, to my mind, the single best piece of hardware Amazon have made by a long, long way. I wrote about the joy of e-ink when I was at Berg, in Asleep and Awake. As Bryan proved, it’s now fairly easy to both source e-inks screens and also to interface with them. 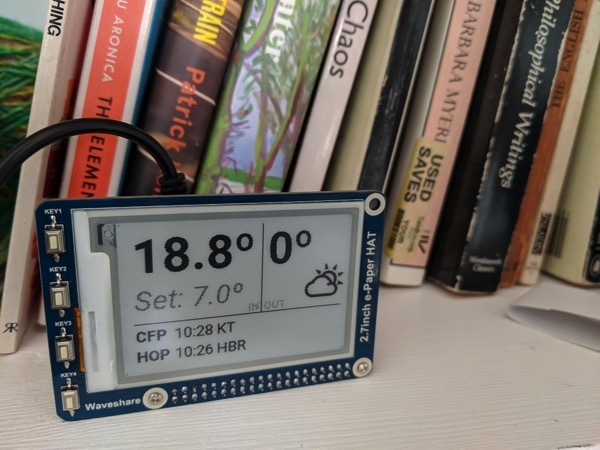 The 2.7″ screen I used came ready-attached to a Raspberry Pi HAT, with libraries all written for it. So: I had a screen, and a Pi. I started with the output: getting a PNG of mocked-up UI to display on the screen. This didn’t take too long, although I’ve had no joy getting partial updates to work – I’m using a fairly heavyweight full screen refresh each time the screen updates. Still, that’s an improvement I can come to later. With the sample PNG on the screen, there were two remaining strands of work: dynamically generating images, and gathering data to feed them. Again, I worked on the former first, using Pillow. I’m not a great Python developer by any stretch, but a recent work project featuring a lot of it made me a lot more comfortable with hacking on the language, and Pillow’s a lovely tool for simple image compositing. Google’s Roboto font and Erik Flowers’ WeatherIcons do most of the legwork; the rest is simple compositing, step by step. Having broken the task down, everything went almost entirely as planned. One by one, I replaced each section of the screen with live content. The only hiccups were the usual wrestling with cron jobs (when do these ever go smoothly?) and dealing with simultaneous writes to the JSON store. (It turned out lowdb wasn’t great for distributing across multiple files, and rather than rewrite everything to use SQLite, I just went with three separate JSON files. Easy fix). Nice to spend a few hours at the weekend motoring on some programming I’m entirely comfortable with: JSON, markup-scraping, server-side fettling and graphics processing. I’m happy with the results. There’s a bit of a distracting blink when the display re-renders, but the lack of a glow makes it feel very different to a more obviously electronic device. It just sits, comfortable with itself, giving me a little bit of information. I was surprised how many people enjoyed it when I shared it on Instagram, so thought I’d write it up. What’s next? I might add something else to that lower-right display; not sure what, yet. And, most importantly, I’m going to give it some kind of case – it’s a bit too ‘gadgety’ or ‘maker-y’ as it stands; it needs to be made more homely. Perhaps some wood. In the meantime, though, I’ve been living with it, and had no desire to repurpose it, or switch it off, which is usually the best sign. Most notably: it continues to affirm my belief that e-ink is a most gentle and domestic technology. I can confirm that it’s now very easy to play with, if you’re so inclined; a Python library and bolting a £30 HAT onto a Pi was all this took to get live. I might do some more tinkering with this technology in due course.